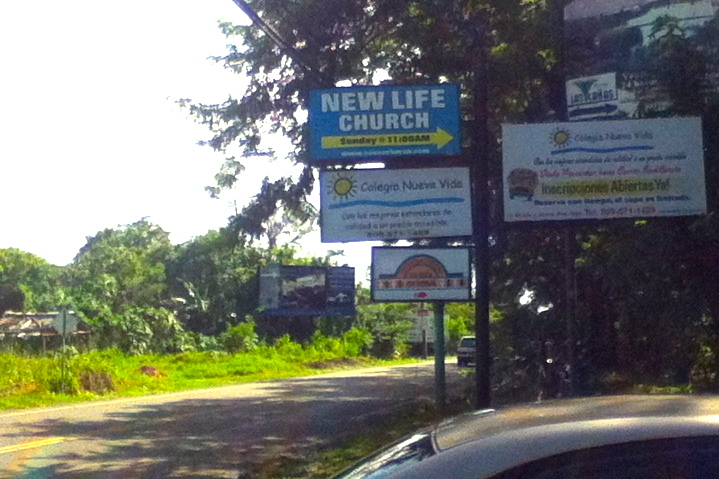 New Life Church is easy to reach from Sosua, Cabarete or Puerta Plata by travelling along Highway 5 (the Highway) until you reach La Mulata 1. The red point marks the location here. Click here to open this map at Google Maps. Blue sign for New Life at the intersection of La Mulata and Highway 5. Turn Here! 1 km east of Playero Supermercado in Sosua, going along the main highway, turn right onto La Mulata 1. You will see a sign just before the turn at the intersection of La Mulata. The turn for La Mulata is directly across the road from Sosua Car Wash, soon after CMC hospital on the left hand side . The church is approximately 500 metres up La Mulata 1, you will see it on your left hand side. The church meets at Colegio Nueva Vida.